Ah, the horror. The wailing and gnashing of teeth. The HUMANITY. We’re not inside yet, it’s just really busy on the South Bank in central London, the last weekend of school holidays and I’m with my friend Ali and her two boys, Billy (9) and Charles (6). 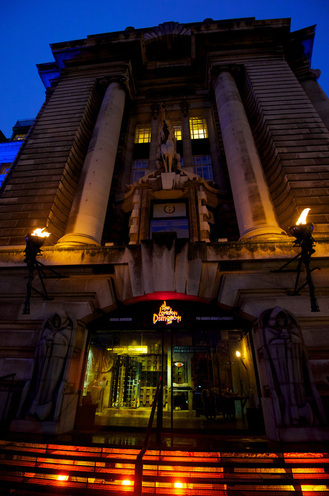 We’re here for the London Dungeon experience, moved here from its former home in London Bridge. There are huge crowds, a testament to its popularity, and though one of the managers tells me they’re short staffed, they’re doing a pretty good job of corralling the masses into something approaching order. Timed groups means that you move through the initial stages pretty quickly, and there are enough spooky-ish decorations and cheery actors to keep lining up (so often the soul-destroying part of any major attraction) from getting too tedious. Billy and Charles are in high spirits, if a little anxious about what it’s actually going to be like. Photos of them pretending to chop off my head with plastic axes are taken. They really like this bit. Inside, it’s a long series of dank, dark caverns, Billy getting more excited and sticking his hand in all the mystery boxes (they contain stuffed rats and other gory props), Charles playing along and loving the cases of actual live rats (not a scarce commodity in modern day London, let alone the Olde Worlde Tymes). The idea is that your group moves through a series of rooms portraying various morbid or unsavoury times in London’s history. The plague is a big theme, of course, along with Sweeney Todd and Jack the Ripper. There are a couple of general spooky presentations before the group gets onto a short motorised boat ride. This doesn’t expose you to too much more than a few scary faces peeping out of the pitch black and some vaguely intense sound effects. Sadly, at about a third of the way through the entire experience, the cumulative shocks and surprises prove too much for brave Charles. He wants out. So do a couple of other younger kids, and the staff are nothing but helpful. It’s me and Billy against the rest of it. Billy is gung-ho and loving every bit, and we pile into each room with the group, sometimes given tasks to do, sometimes shouted at, sometimes regaled with historic tales. The variety is impressive, each actor committing to their roles with gusto, and a nice range of high-tech and creepily analogue effects bring myths, legends and actual history to life with a camp-ness and visual spark that works for braver kids and adults alike. Jets of air tickle you at unexpected moments, failing light switches provide an opportunity to play with the audience for the mischievous actors and the fittings fall from the walls at unexpected moments. Lots of crowd participation is weaved in, and the set pieces –especially the live autopsy on the plague victim, I thought – were visceral and entertaining. Billy is transfixed, and gets picked out to help the actors on a coupe of occasions, relishing each little role play. The tour ends with a fairground-style ride that simulates dropping from the gallows – a fittingly gruesome way to close up what is a good-value tour that lasts almost two hours. Ali and Charles are waiting for us as we emerge, blinking in the daylight. Charles is feeling brave again. Billy is on a complete high. The lesson: perhaps the Dungeon isn’t quite the thing for sensitive six year olds, but really is the thing for gore-curious nine year olds. I’d think about how your kid reacts to extended periods of dark and surprise, is all. Most of the children from around 8-14 that I saw loved it. And with that we rejoin the cackling, braying, sobbing hordes. My personal ultimately terrifying dungeon? A busy weekend in Central London with all the world trying to get into the same public toilets. I sometimes think Sweeny Todd had some progressive ideas.